Oxygen Facial is based on new technology that delivers pulsated oxygen and a specially formulated skin serum deep into the epidermis, promoting healthy skin restructuring, elasticity and firmness. Micro water molecules penetrate into the skin, softens the pores, speedy comfort balance skin PH, shrink pore, availability intercede skin energy. 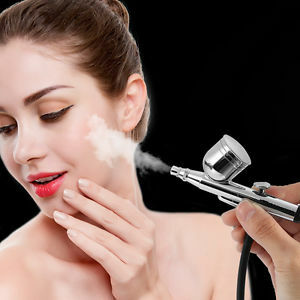 The facial involves a machine that sprays atomized moisturizers onto the skin using a stream of pressurized oxygen. The treatment is supposed to hydrate skin immediately, making the face appear smoother and plumper. Our skin cells have a limited lifetime. They die, and new cells replace them. Oxygen is crucial for cell regeneration. It increases the rate at which new cells grow, which, in turn, helps in scar (from acne) healing. The oxygen facial gives an extra dose of oxygen to your skin cells, thus aiding faster cell turnover. Constant exposure to the sun, dust, and pollution rob your skin of its natural moisture content. This makes it extremely dry and lifeless. And if you have dry skin and dehydrated , these issues can make your skin worse. The oxygen facial deeply moisturizes your skin, restoring its pH balance and shielding it from sun damage. The process of delivering the oxygen and serum is quite gentle, which makes oxygen facial suitable for individuals with sensitive skin and for those who would rather avoid injections or chemical treatments. After an oxygen facial, you can resume normal activities immediately, even applying makeup and using your normal facial products. After an oxygen facial, you can expect to see a more refreshed and rejuvenated complexion. One that makes you look well-rested with a just-back-from-vacation glow. For this reason, the oxygen facial is perfect before special occasions when you want to look your best without any downtime.